Traditionally, there were only two ways of owning a car – either you bought one or leased it. Once you decided which one you wanted, it meant you were in it for the long haul. With leases typically lasting 3 years and buyers sometimes owning their cars for decades, a car had to check off all the boxes and meet all your needs. What if that doesn’t need to be the case anymore? What if you need an SUV for a road trip with the family, want to impress a client in a luxury sedan or take your spouse out for date night in a hot convertible? Now all of that is entirely possible without having to actual own a single car. No, we’re not talking about renting; we’re referring to the idea of the on-demand, subscription based car service. For those of you who remember Netflix’s beginnings prior to streaming, subscription car services are like ordering a DVD (remember those?) from Netflix and giving it back when you were finished. Think of it as having access to a fleet of vehicles that are at your disposal anytime, anywhere. Just pay your monthly subscription fee like you would a lease payment and you are now granted access to an array of cars to choose from whenever you see fit. 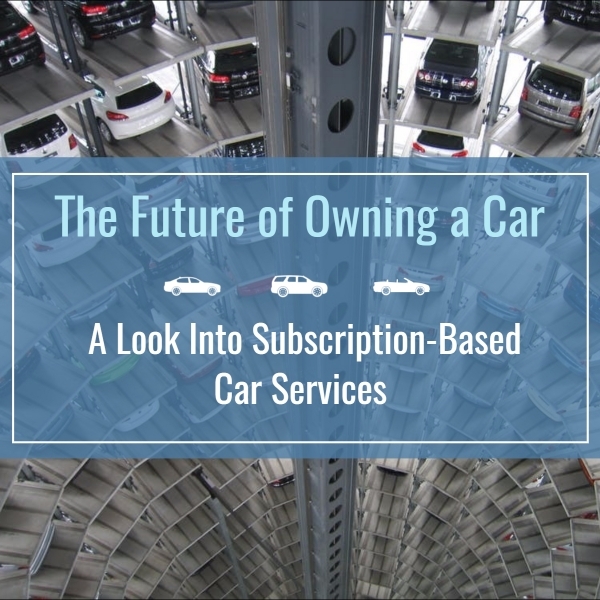 While that is a basic overview of what a subscription car service is, companies vary several different ways. Most companies include insurance, maintenance and “swaps” (the flexibility to switch for another vehicle at any time). Where they vary are the kinds of cars and how the consumer is charged. Companies like Yoyo (http://joinyoyo.com/) price per-mile. They have three tiers of vehicles which are all priced differently per-mile. You want a Honda Fit to zip around town? That’ll be 50 cents a mile. Looking for something a little sportier like a Ford Mustang? That’ll run you 75 cents a mile. Really trying to impress company? Order yourself a Cadillac Escalade and pay $1 a mile. Other subscription service companies like Canvas (https://drivecanvas.com/) take the idea of a long-term lease and cut that into a month-to-month decision the consumer makes on their own. You pay a price depending on the mileage you choose and by the time your month is up, you can either decide to go another month with the same car or swap it out for a new one. While the subscription car service concept is still new, it has caught the attention of car manufacturers who are looking to launch their own iterations from the likes of Porsche, Volvo, Cadillac with others sure to follow suit if it turns a profit. We’re curious to see if this concept catches fire and if drivers decide it’s here to stay. If so, we could be looking at an entirely new way of car ownership. The first step is always the hardest, but you're already here, so first step completed. Next step is easy - follow the link and Book An Appointment.